Any of our Boat Lifts can be used as a pontoon boat lift with the addition of our Pontoon Adapter Kits. We offer two different styles of Pontoon Adapters - a Floor Adapter and a Tube Adapter. The Floor Adapter (shown above) is an extension that clamps directly to the cradle and allows you to lift your boat up from the under floor of your Pontoon boat or Tritoon Boat. The Tube Adapter (not shown) is an extension that clamps directly to your cradle that allows you to pick your boat up directly from the tubes themselves. 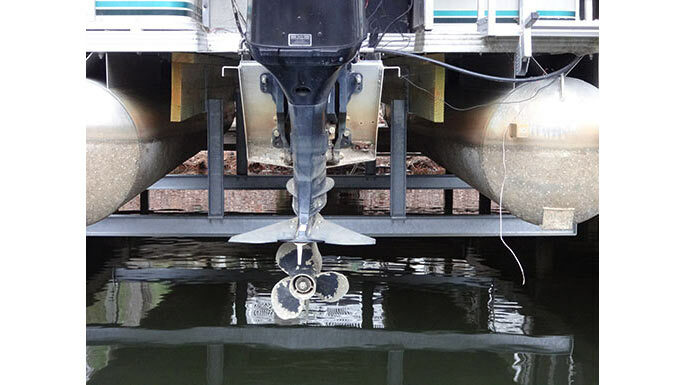 Our tube adapter is designed to hug your pontoons allowing for a safe and gentle lift.